Post 1 tackled onboarding yourself with your new company and offered strategies for cutting through what we call the fog of transition. Post 2 offered concrete steps for balancing the need to learn with the need to take quick action to achieve early wins. We call this our Secure & Get Right method (days 1-30). 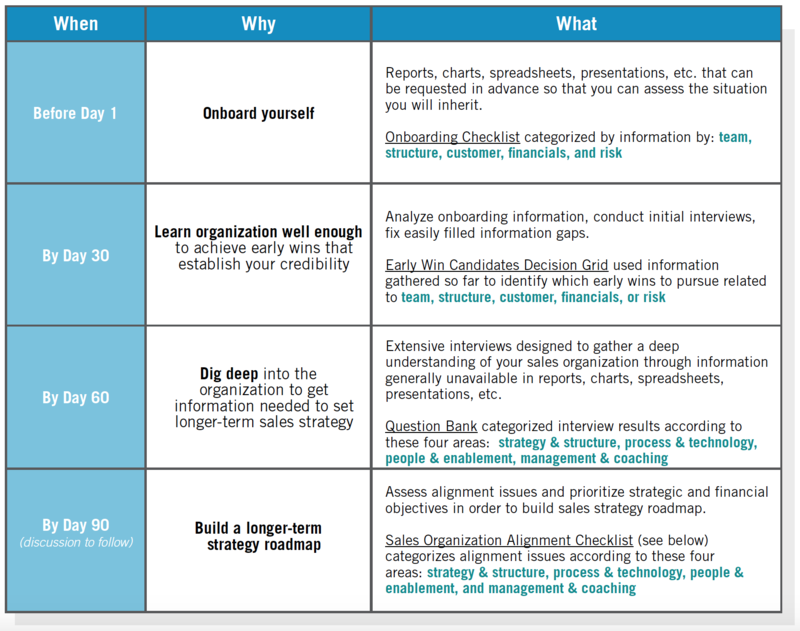 Post 3 showed you how to dig deep into the sales organization so that you can systematically surface the knowledge you’ll need to determine longer-term strategy. We also gave you a brief introduction to a typical “alignment issue” (days 30-60). Taken all necessary steps to secure your team, secure your customers, and get the initial structure and financials right. Achieved early wins in order to establish firm credibility with your management, peers, and direct reports. Crystallized the business situation you’ve inherited (start-up, turnaround, mandate to grow, or maintain status quo) well enough that you generally understand where the opportunities lie and what might need fixing. Be well on your way to establishing political alliances and cultivating relationships with influencers who will be instrumental to your future success and that of your team. that you intend to make, particularly those of the “I’ve always done it this way” variety. The other transition traps are important, of course, but you’re more likely to encounter this one as you begin implementing your longer-term strategy. Organize all learnings to date and review them: what do you see? The theme that threads its way through all four of our blog posts and every single one of your first 90 days is learning. We’ve asked you to gather an enormous amount of information, so let’s talk about how to organize it to make sure you can both see the big picture and build a sound sales strategy that minimizes the need to rely on assumptions. So, let’s get tactical on how to do that. First, choose a technology medium that you’re comfortable with, then stick to it. Go low tech and use a spreadsheet with five tabs labelled as we’ve suggested above. Or use more free-form technologies, like Microsoft’s OneNote or Evernote. Third, use the tools we’ve offered throughout this entire four-blog series to draw conclusions that will naturally lead to a list of potential roadmap objectives. Keep a running list of objectives and continually prioritize them as you analyze your learnings. That makes building your roadmap easier. Way back when we published our first post in this series, we cautioned that you’d likely experience an overwhelming temptation to NOT be as rigorous as we recommend in your learning effort. Skimp on this activity and you may not be able to recover from the inevitable mistakes. So, we urge you delegate where practical, but do not back away from the heavy lifting when it’s not. Moving onto Alignment: What’s the Big Deal? Alignment is important, so let’s define it. 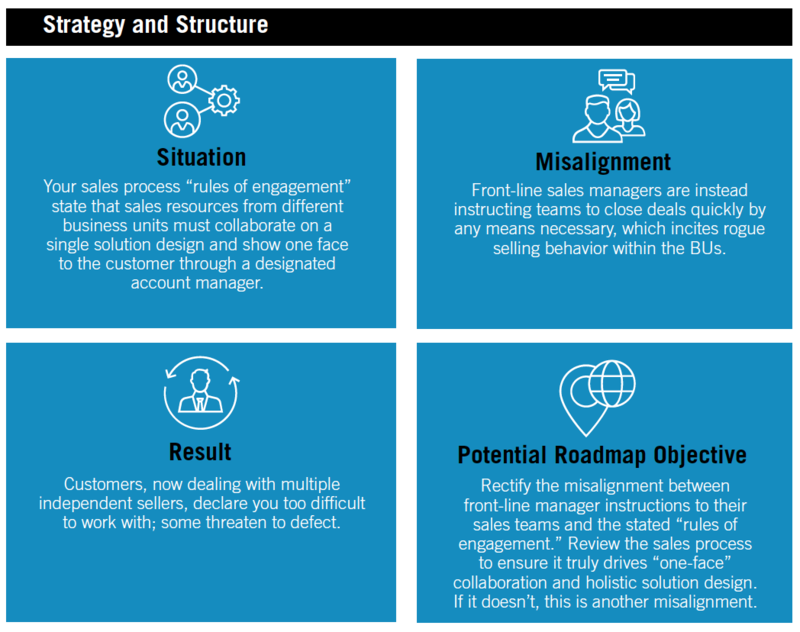 Any misalignment between moving parts in your sales organization creates drag, which can result in anything from mild annoyance (unnecessary meetings) to real harm (lower revenues because compensation is incentivizing the wrong behavior). You control the engines of revenue for the company, so any alignment issue that affects the sales organization is potentially affecting the company’s ability to make money efficiently. Candice Freeman discovered as much when, after being acquired, her new company’s management simultaneously handed her a) a mandate to obtain recognized revenue faster and b) a compensation structure that, instead, rewarded sellers for getting contract signatures – a misalignment between sales objectives and seller behavior that produced an undesirable result (see Post 3 in our series). Sometimes misalignment occurs when a well-intentioned go-to-market strategy falls victim to the pressures of having to hit a sales quota. Here, the misalignment is not overtly stated or part of an official policy. Instead, sellers observe misalignment behavior in the ranking sales leader and tacitly agree to perpetuate it. Say your go-to-market strategy is grounded in delivering a superior customer experience. But the current reality includes revenue shortfalls, cost over-runs, and a Sales VP who’s harping on close rates and travel expenses. Every seller knows the quickest, cheapest route to a contract signature is a transactional sale that all but ignores the customer experience. So, some will take it, no matter what the official go-to-market strategy is. Anyone who’s been in sales longer than 5 minutes has experienced this situation. How, then, do you identify alignment issues and decide which ones you’ll address in your sales strategy roadmap? By using our tool. 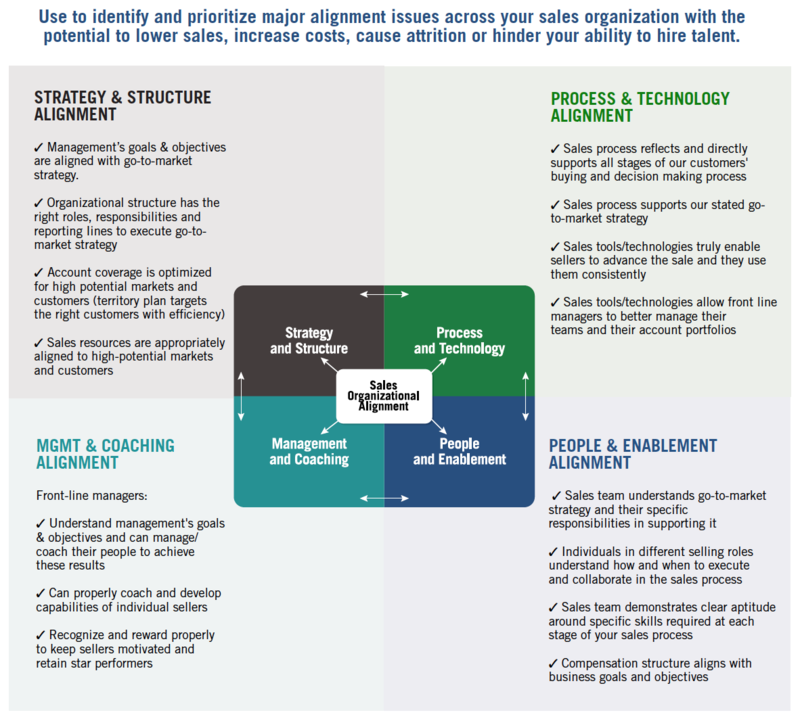 Below is our Sales Organization Alignment Checklist, which will help you diagnose and prioritize any alignment issues. You should be able to verify that each checklist item (those that apply) is either in or out of alignment based on your learnings. If you can’t complete this matrix/checklist, then you still have some information gaps. Go fill them. Once you’ve identified areas of misalignment, rank their importance based on stated mandates, initiatives, or objectives from your management. You get the idea. We suggest starting with Strategy & Structure and working your way clockwise around the grid to identify major alignment issues that you have the power to correct. Now it’s time to narrow your potential objectives down to three or four and prioritize them. 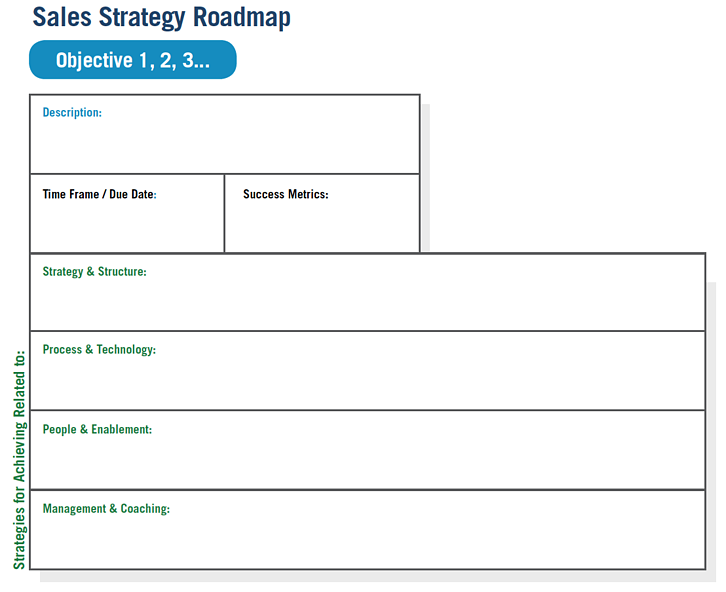 Next, we’ll use this prioritized objectives list to populate our Sales Strategy Roadmap template shown below. After that, you’re first 90 days are up, and it’s time to start executing your roadmap. If all this seems a little too neat and tidy for the amount of chaos you expect to contend with well beyond your first 90 days, it might be. But without a plan you’ll just be reacting to whatever piece of your sales organization is on fire that day – and that won’t drive results. Besides, we know setting sales strategy and actually sticking to its execution is possible. We’ve seen our clients do it. One Sales VP we’ve worked with was so committed to his sales strategy that he encased his roadmap in plastic and carried it around with him. If an executive were to ask about his business, he could explain his strategy and current progress against objectives in realtime. (He’s a division president now). Notice that “strategies” are broken down into familiar categories on the template. This ensures that you cover all of your “how-to” bases and prevents you from having a plan that’s long on ambition and vague on detail. 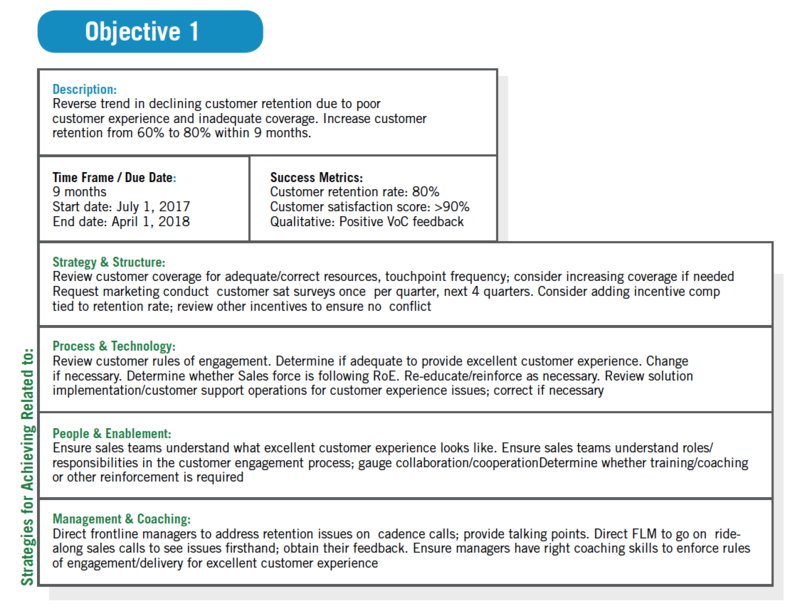 Let’s see what a completed roadmap objective might look like by going back to our customer retention example from earlier. Complete a similar exercise with all of your top objectives (keep it to a manageable number) and then decide how you’re going to execute your mini-strategies to grow your organization. We hope you’ve enjoyed our four-part blog series on a Sales Leader’s First 90 Days. Following our method, using our tools, and above all, putting in the recommended effort to learn will help you avoid mistakes and reduce your time to growth. For a full compilation of this blog series, along with added detail and tools, download our Sales Leader's First 90 Days eBook here.